What If Everyone Could Make Videogames? Recently I've been playing some very interesting games from some very interesting places. First was an Iranian game, where I tried to rescue Iranian nuclear scientists from American forces. Second was a Kenyan game where I searched the countryside for ancient African artifacts, while avoiding hostile tribesmen. And just a few days ago I played a Lebanese game where I was an officer trying to prevent Israeli forces from crossing the border into Lebanon. None of these games have hit the shelves in the U.S., nor should you expect them to, unfortunately. But each of them taught me things about the people who made them, the cultures in which those people live and the concerns people have there. That wasn't necessarily these games' intent, but it was an interesting side effect. People in the game industry have been arguing for years: Are videogames art? We each have our own belief on that. But less arguable is that videogames are media. Games express messages and have the unique ability to inform and educate people in an interactive, engaging and entertaining way. 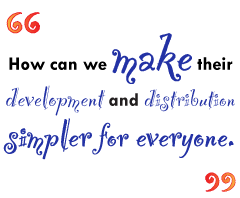 How can we make their development and distribution simpler for everyone so that expression can come from more diverse sources? When I was young, my brother and I made up games to play with our plastic army men. Later, we moved on to electronic games with more rigid rules, like Electronic Quarterback, Quiz Wiz and Dark Tower. Eventually, we both discovered computers and fell in love with creating our own games. I remember spending many evenings in the back room at the elementary school, typing in long listings from Compute! magazine in order to compile my own games. Then, saving the programs to tape, I would come back the next day and tweak the program to try to "change the rules" so I could win or find out why I couldn't get past a certain challenge in the game. These games framed my childhood, and as I grew older my dabbling with computer games grew, and so did the game industry itself. What has changed is the complexity of our games. As computing power has grown and the videogame industry has matured, we've moved from simple videogames of "Eat all the pellets" and "Destroy all the aliens" to games that tell detailed stories, that immerse the player in a complex world and ask them to make challenging moral and ethical decisions, decisions that impact the story. The messages these games offer vary broadly. Games like Brain Age and Jam Sessions encourage us to challenge ourselves, learn skills and exercise our brains. Games like Full Spectrum Warrior and Call of Duty focus on good vs. evil, but the focus is more on the action and less on the back-story. An increasing number of games have deliberate messages, like Starbucks' Planet Green game, which is an environmental statement, or Veggie Games' Steer Madness, which encourages veganism. Games like Food Force, The Howard Dean for Iowa Game, Darfur is Dying and September 12th all have very deliberate messages.